I sometimes get information from a group called Sustainable Conservation, which is trying to promote a new program in which landowners are rewarded, in real dollars, for responsibly managing the natural resources under their care. The underlying philosophical concept goes by the name "ecosystem services." According to Sustainable Conservation, this is the "next big idea in conservation." 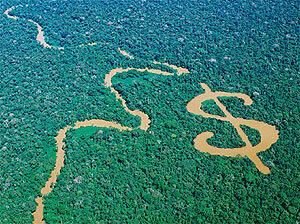 In short, the idea is to put an economic value on the "services" that are provided to our world by the natural world. As an example, if preserving forest landscapes for their watershed "services" is valuable, then the public should be willing to pay property owners to preserve and protect those landscapes. There is a problem with this approach. If we start getting the idea that the public needs to pay private property owners to respect the natural world, then the implication is that the natural world is in second place behind our economic arrangements. If the public can't or doesn't "pay" for those "services" that come from the natural world, it would seem proper for property owners to destroy the natural world to get paid in some other way - by clearcutting our watersheds, for instance. Suggesting the primacy of our human economic arrangements over the requirement that we respect the limits of the natural world, upon which all life depends, is a very slippery slope. If this is the "next big idea in conservation," we are in deep trouble.